By the end of this year space travelers will board the first commercial rocketships and fly into orbit. Jeff Bezos of Amazon, Paul Allen of MicroSoft, and others are stepping up to fly us into space. Elon Musk has said he will be putting humans on Mars by 2026. New entrepreneurial companies are also on the scene, with goals ranging from lunar landings to asteroid mining. The U.S., European and Chinese governments are planning lunar outposts. Conversely, some say the private sector cannot succeed in space, while others question the need for human space exploration at all. 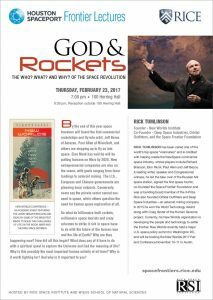 So what do billionaire-built rockets, millionaire space tourists and crazy schemes to strike it rich in space have to do with the future of the human race and the life of Earth? Why are they happening now? How did all this begin? What does any of it have to do with a spiritual quest to explore the Universe and find the meaning of life? Why is this possibly the most important human activity of all time? Why is it worth fighting for? And why is it important to you? 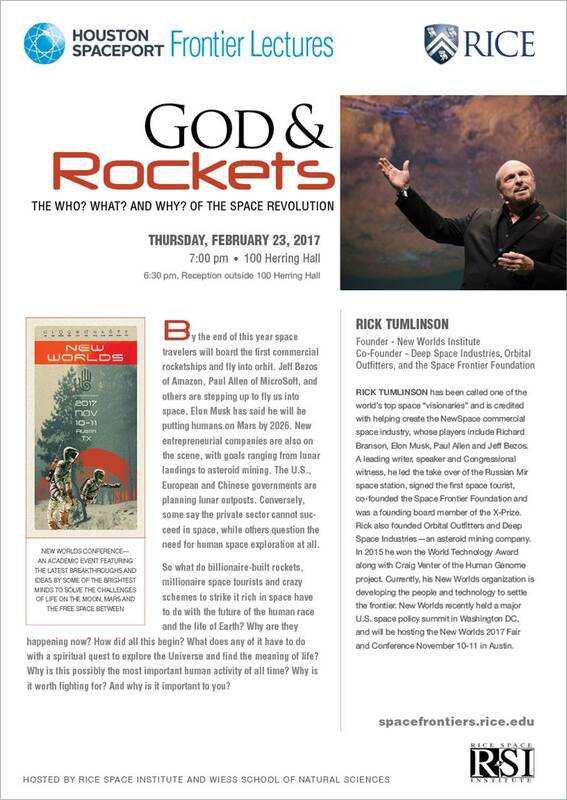 RICK TUMLINSON has been called one of the world’s top space “visionaries” and is credited with helping create the NewSpace commercial space industry, whose players include Richard Branson, Elon Musk, Paul Allen and Jeff Bezos. A leading writer, speaker and Congressional witness, he led the take over of the Russian Mir space station, signed the first space tourist, co-founded the Space Frontier Foundation and was a founding board member of the X-Prize. 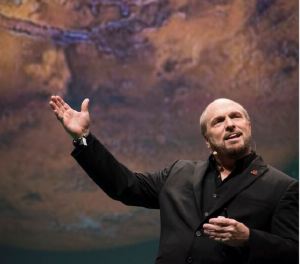 Rick also founded Orbital Outfitters and Deep Space Industries — an asteroid mining company. In 2015 he won the World Technology Award along with Craig Venter of the Human Genome project. Currently, his New Worlds organization is developing the people and technology to settle the frontier. New Worlds recently held a major U.S. space policy summit in Washington DC, and will be hosting the New Worlds 2017 Fair and Conference November 10-11 in Austin.